Okay, so some of you may have clicked over from here. You may find some repetition in this post, so bear with me. Please? This little concoction is my answer to the “I don’t know what to cook, but I’ll probably be hungry later —and tired—, so this will do” situation. 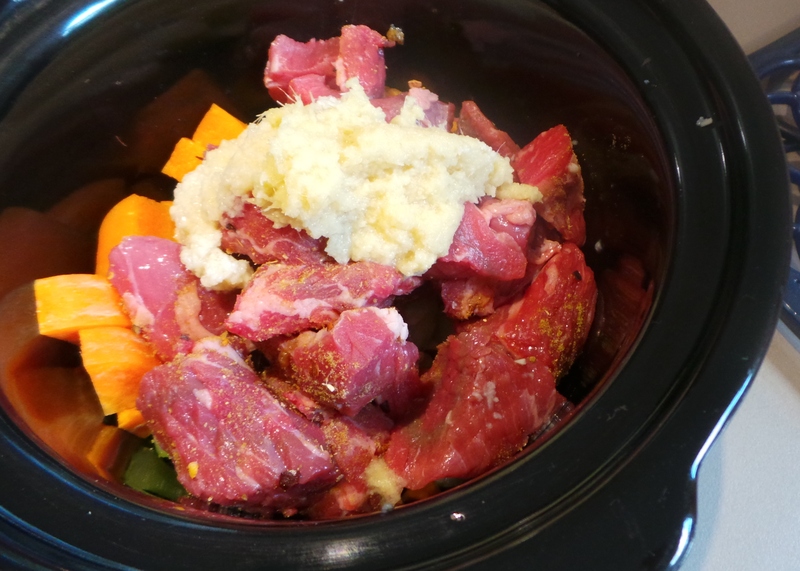 This is something I can get into the slow cooker in minutes and serve a few hours later – filling my home with gorgeous smells in the intervening period. I own several slow cookers but the one I use the most has got to be my smallest one. It’s a 1.5 litre or 1 quart sized appliance and it’s perfect for meals for two. All the photos in this post have been taken with this device. 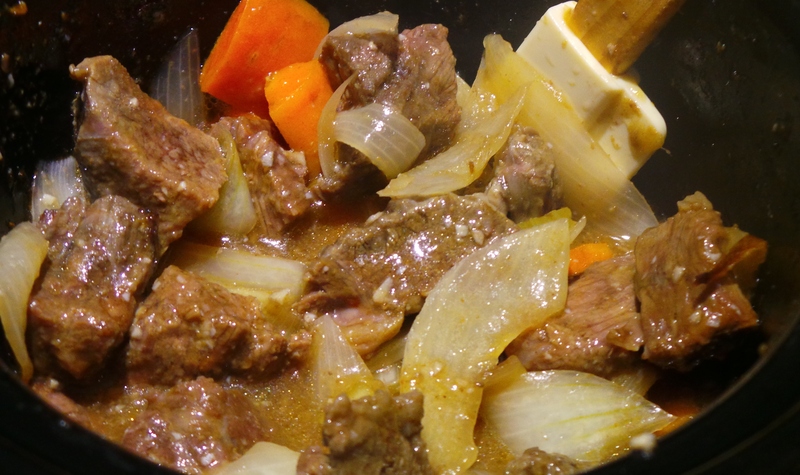 Feel free to double or triple what I do here and then cook it in a larger slow-cooker. It will take longer than the few hours a small one would use to cook the smaller portion, but not much longer. 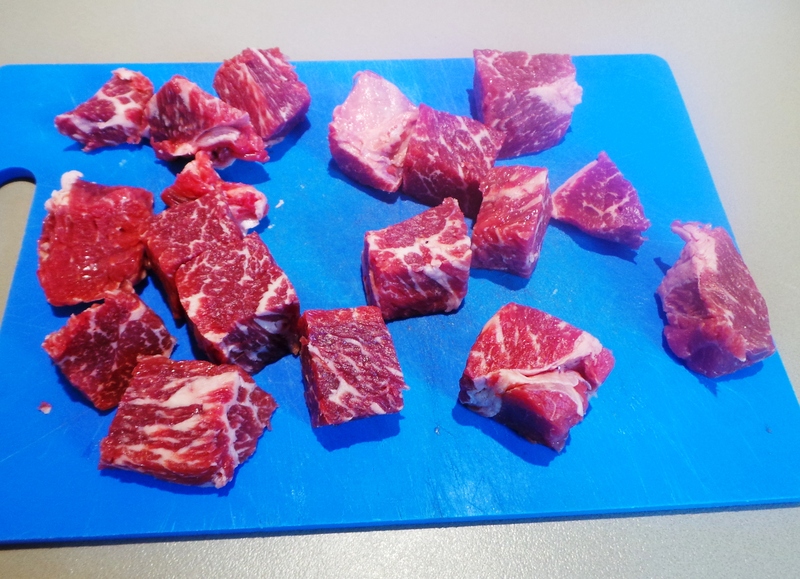 Start with half a kilo or a pound of chuck steak and cut into large cubes. 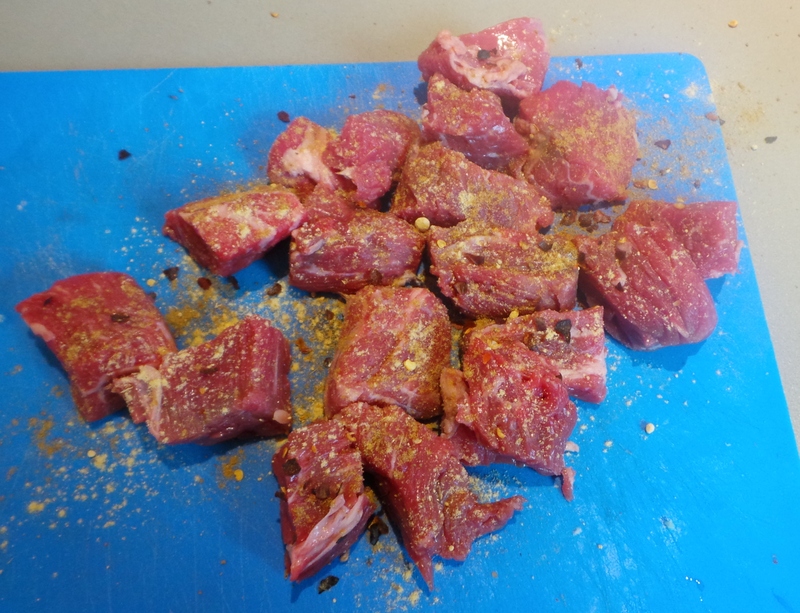 Add your spices to the meat on the cutting board. You can measure them carefully if you wish, I just tend to give each a good shake until I think the meat looks covered enough. I’ve had readers *demand* I give an actual measurement though, so start with a teaspoon of each and then decide if future versions need more or less. It’s completely up to you. 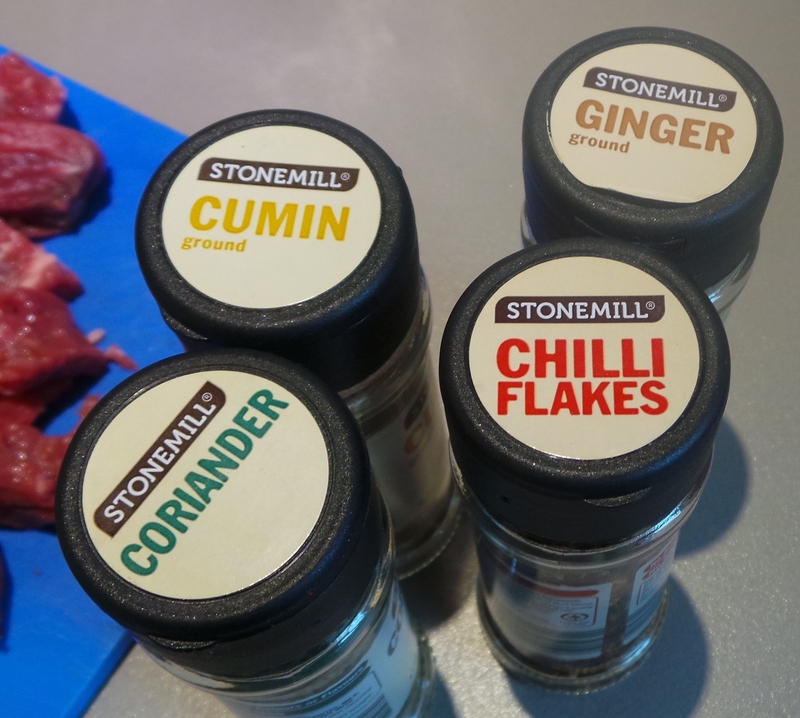 I find ground cumin, ground coriander and ground ginger combine really well as an accompaniment to beef. It’s a combination that you’ll find often on these pages, but that doesn’t mean you have to use them. If you don’t like ginger, leave it out, it’s your meal after all. On the other hand, if you are new to this cooking lark, give it a shot and see how you go. You never know, it may win you over. 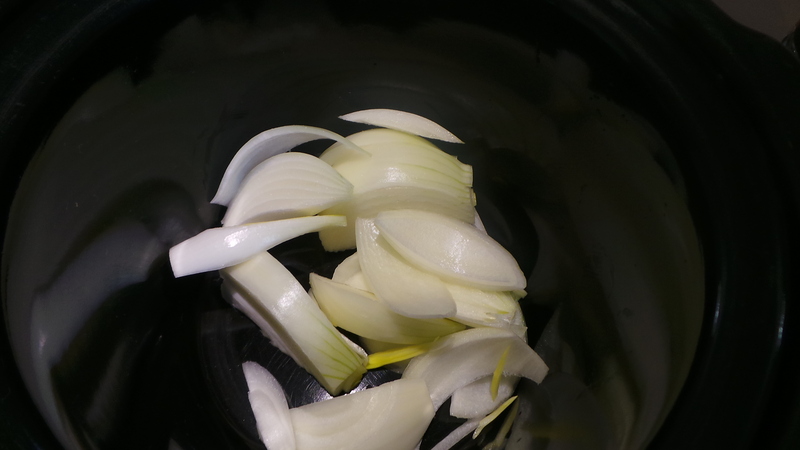 Now, I prepare some vegetables for the pot. 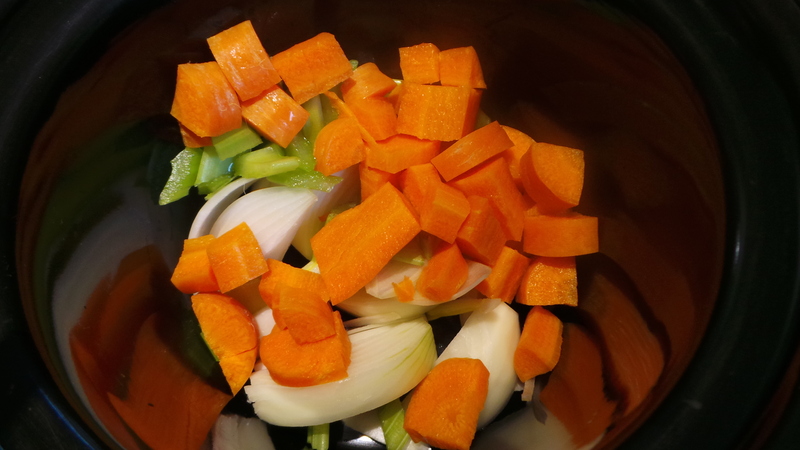 It’s a very simple, very traditional combination of an onion, a carrot and a little celery. Cut your onion into crescents. 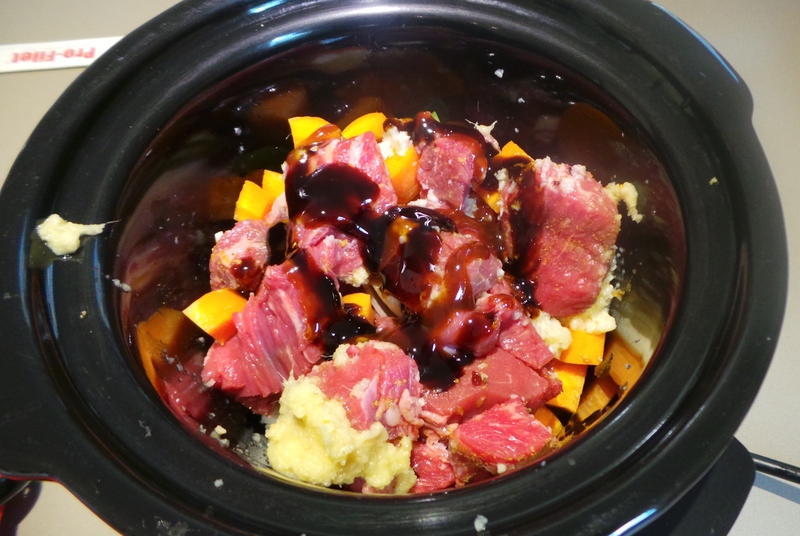 Add to the base of the slow cooker. Dice your carrots and celery and add them as well. Now place your spiced meat into the pot, on top of the vegetables. Don’t stir yet! I always keep these guys in my refrigerator, add a good teaspoonful of each to the pot. 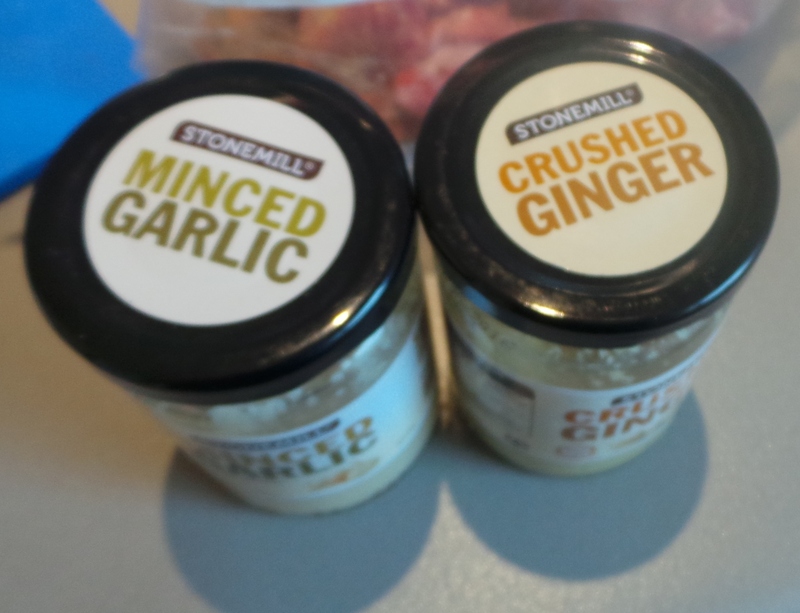 Up the flavour with some fresh ginger and garlic. Now add a good glug of the sauces you’d like to use. 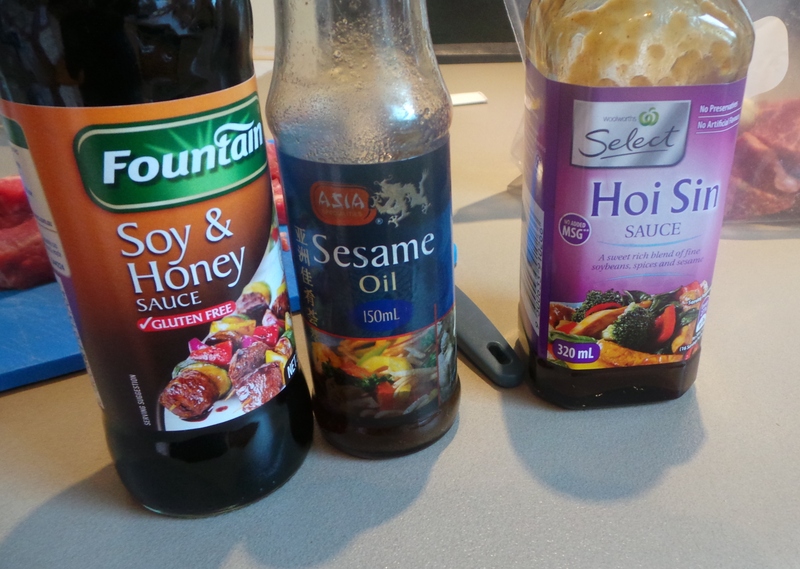 On this occasion, I had these in my refrigerator door: Soy & Honey sauce, Hoi Sin and some sesame oil. *A ‘glug’ may be translated as a tablespoon or so. You’re just adding flavours, not creating a cooking medium. Add a few glugs of whatever sauces you wish to the pot. You may wish to use plain soy sauce, black bean, teriyaki, sweet chilli, oyster sauce, kecap manis…the list goes on. You don’t have to use a mix, you may use just one if you prefer (or if that is all you have). As you can see from the picture above, the meat and other ingredients are only lightly coated by the sauces and spices. Place your pot on either low or high, depending on how quickly you wish to eat. This took my small slow cooker only 2.5 hours on low. 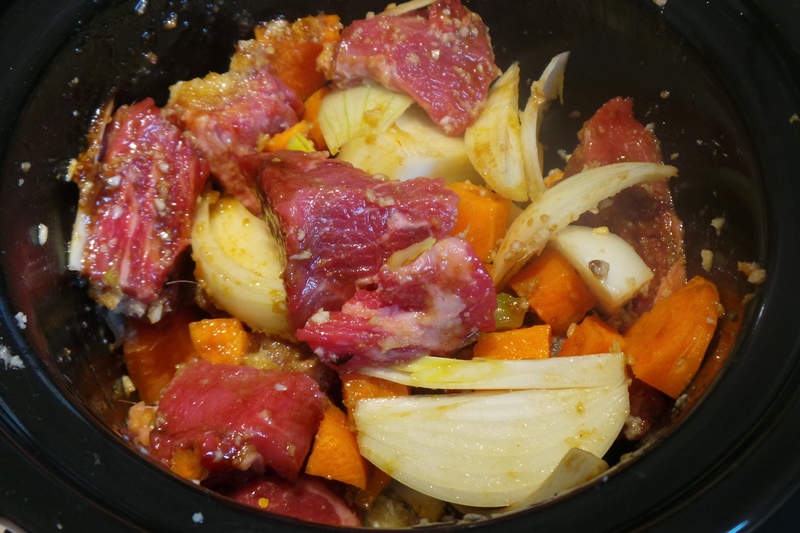 If you are making a larger amount of this in a larger slow cooker, it will take longer – possibly 4 -6 hours on low. As you can see, there is quite a bit of liquid in the bowl. This can be left as it is, or thickened with some cornflour. Instructions on how to do this can be found here. 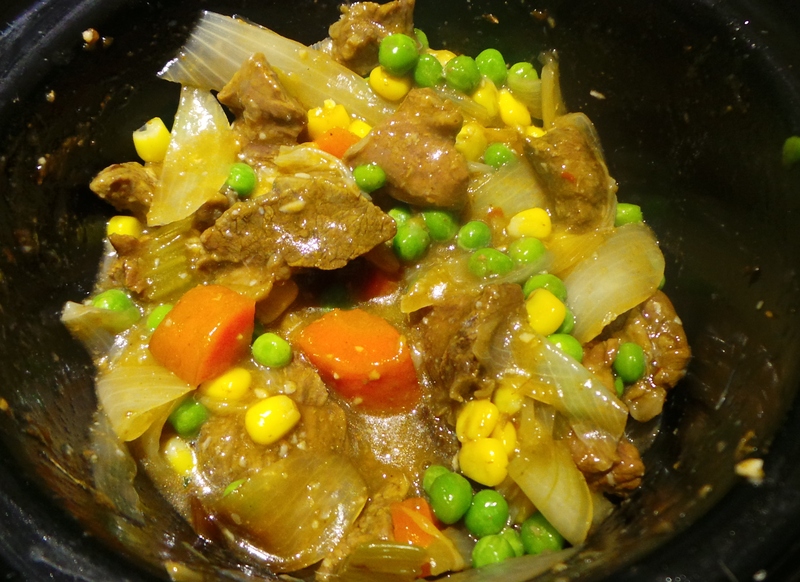 I felt that I’d like a few more vegetables in this, so I stirred through a handful each of frozen peas and frozen corn and popped the lid back on the pot for 30 minutes while I steamed some jasmine rice. 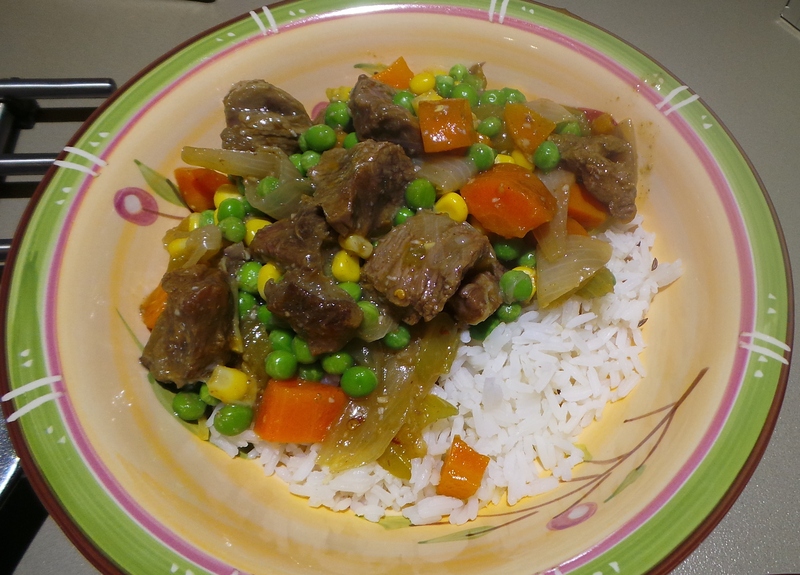 The final dish served with rice. If you wish for a more tender version (although this is fab!) follow the instructions here and leave it overnight in the refrigerator before cooking.